Last winter, I started getting into upcycling and recycling old fabrics like jeans and I’ve really been wanting to take apart some old sweaters. Our Goodwill had a great selection of old men’s sweaters which means more fabric for me! Well, I personally really like fingerless gloves. They are generally not as bulky as gloves with fingers or mittens and you can still do your work like typing on the computer. And since I’m not the best at knitting or crochet, repurposing a sweater into gloves is perfect. 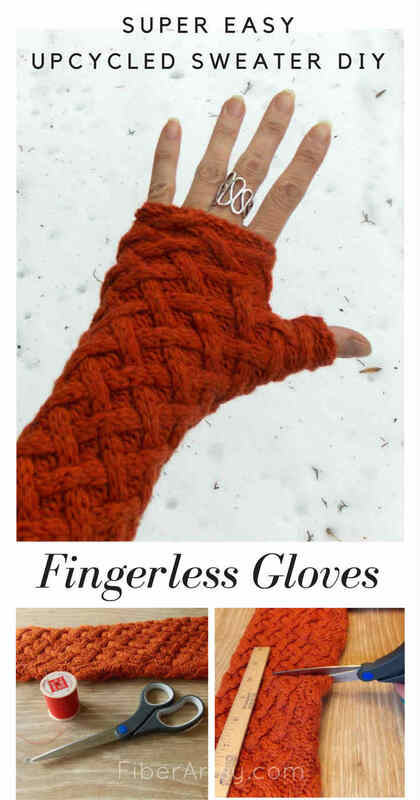 These fingerless gloves from a sweater are also much easier to sew than regular mittens. 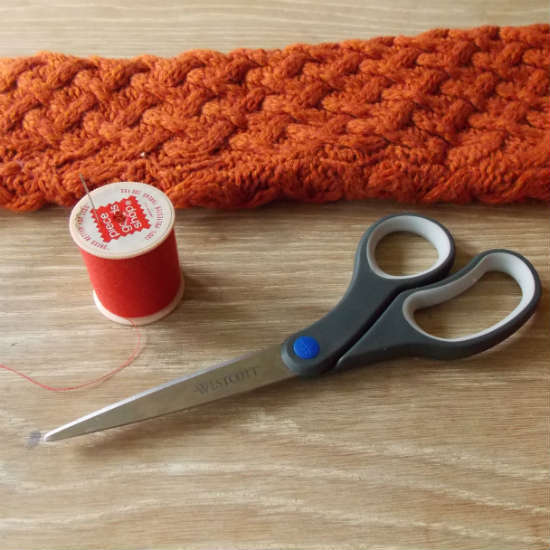 This whole project is a super quick with minimal sewing and absolutely no knitting or crochet required. 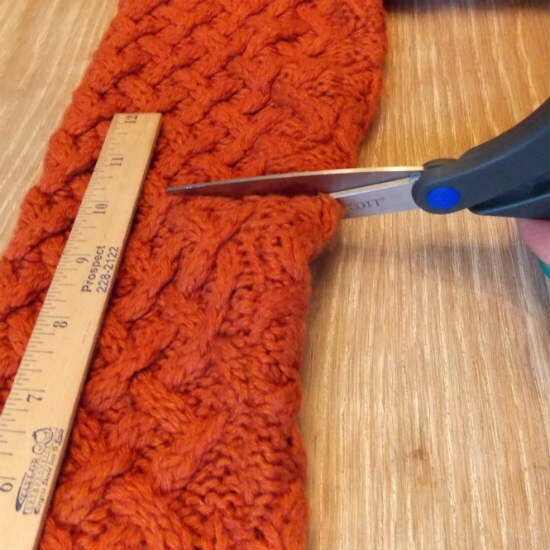 First, you need to decide how long you want your fingerless gloves to be, then using your fabric scissors or rotary cutter, cut the sleeves 1″ longer to allow for the hem. I wanted gloves to be 9″ long so I cut the sleeves off at 10″ from the cuff. If your sweater is very bulky, you may want to pin the edges before cutting them so keep it from raveling. Put your hand in the sleeve to figure out where to stitch the seam for the thumb. You may need another person to help you with this. 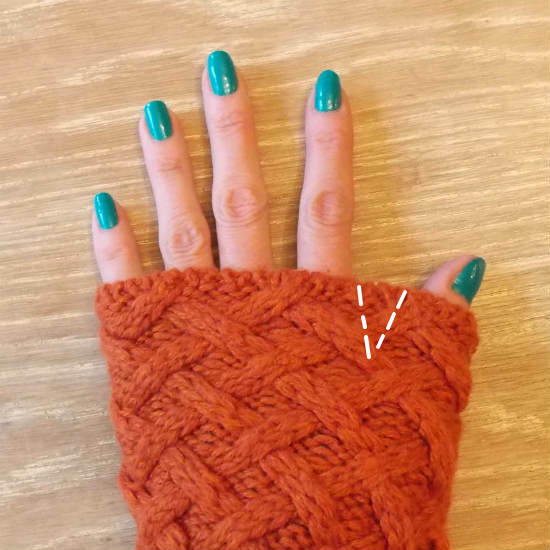 On the inside of the sleeve, sew a ‘V’ between thumb and forefinger. I double stitched to make sure it would hold up. Next, you want to carefully cut out the ‘V’. Turn right side out and repeat with the second sleeve. The sleeves for this old sweater were nice and snug on my arms. If yours are too loose, simply fit them to your arm, pin and sew along the inside. Repeat all of the steps to make a second glove. That’s all there’s to it. This really is a great way to repurpose an old (maybe ugly) sweater. 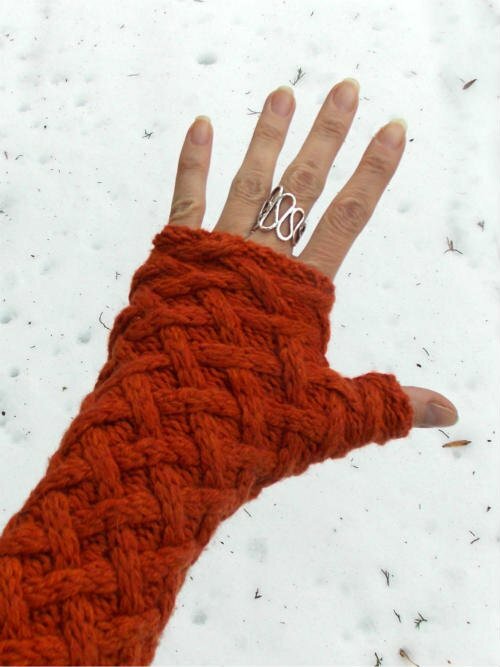 Plus, These DIY fingerless gloves are also a great gift idea for Christmas or Birthdays. Love this idea! 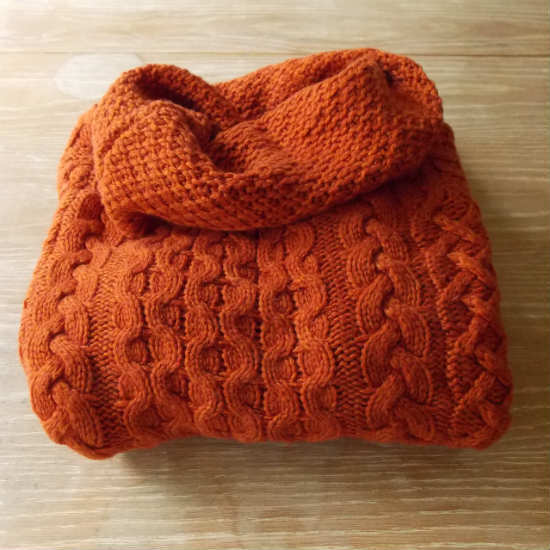 I have plenty of old sweaters I could make warm, cozy things with! Thanks for sharing with Small Victories Sunday Linkup and hope you join us again this weekend! Pinning to our linkup board. I absolutely will! Thank you for hosting! That is so very clever and it looks so good and warm. Thanks so much for coming to the party with this helpful post. This is really clever. I have several old wool sweaters that have seen better days and shrunk a bit by mistake. They would be perfect. Thanks for posting. Yes! Shrunk and a bit felted is even better. Let me know how it turns out!